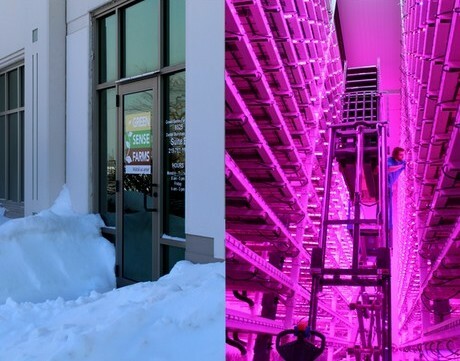 "This is the number one reason why indoor farming makes sense," says Robert Colangelo from Green Sense Farms as he shows us the difference between dozens of centimeters of snow outside and freshly growing veggies inside his farm in Portage, Indiana. Temperature hits a minimum of -19F and there's a warning for the wind chill. How are growers all over North America coping with the temperature? While the team with Green Sense Farms may be used to not being bothered by the outside temperatures, things are different for Great Lakes Growers. Growing hydroponic lettuces and hydroponic herbs in Ohio, they're currently facing -4F. "We are holding temps just fine inside", John Bonner tells us. "For efficiency purposes, our energy curtains and vents remain closed even during the daylight hours. The plants are getting much less free energy from the sun. High efficiency, high output LED fixtures save the day though. It definitely costs a LOT more to operate a greenhouse when conditions like this present themselves." And there's more. The current expansion with Great Lakes Growers has slowed a little. "The working conditions are less than ideal", John says. However, there's a positive note to it all. "The relatively warm, moist air contacting the sub zero side wall glass makes for some interesting frost formations!" Right: The wall glass is covered in some pretty neat designs! The team at the Michigan State University Extension also has to cope with the cold. Being based in West Michigan, they currently have to deal with -5F and a wind chill of -19F degrees. Heidi Lindberg, Greenhouse and Nursery Extension Educator with MSU, explains how the temperatures combined with the rapid housing development affect the availability of natural gas provided by the utilities and the ability for greenhouses to reach their setpoints. "The heavy usage of heaters and other equipment to raise the temperatures in growing areas increases the risk of fires and accidents." "Yesterday, there was a fire at one of the main natural gas utilities’ compressing stations in suburban Detroit and as a result they are asking everyone in the lower peninsula of Michigan to turn down their thermostats to 65 degrees F or less. The governor declared a state of emergency 2 days ago and emergency management crews are working overtime with the occasional whiteout conditions on the roadways causing massive car pileups and the need for warming centers for people who do not have access to somewhere of their own." "Last Tuesday, before the polar vortex came, it was extremely cold", Heidi shares. "One greenhouse in Allendale, MI had the alarms go off at 3 am because the pressure of natural gas coming into the facility was a third of what it should have been at the street. They immediately sent out work crews to bypass a regulator and make sure that they greenhouse was getting the full pressure that they needed. They had some crop damage as a result of the cold temperatures." 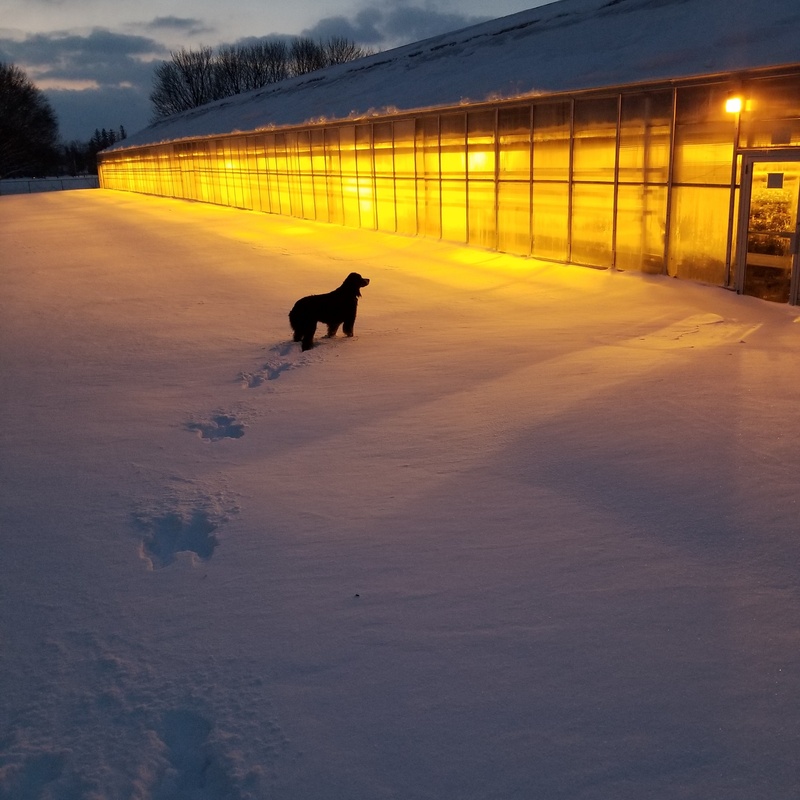 Another greenhouse in Hudsonville, MI had a small fire in a motor and found that two of their unit heaters had cracked heat exchangers, which released ethylene into the greenhouse. "These below zero temperatures, and the rapid housing development in west Michigan are definitely straining both the utilities ability to provide natural gas and the ability for greenhouses to reach their setpoints. The situation isn't any better in Canada. "-23°C this morning on the thermometer. 'Lekker Fris!' my dad used to say on days like today! ", Ed Vermolen with Aldershot Greenhouses shares. 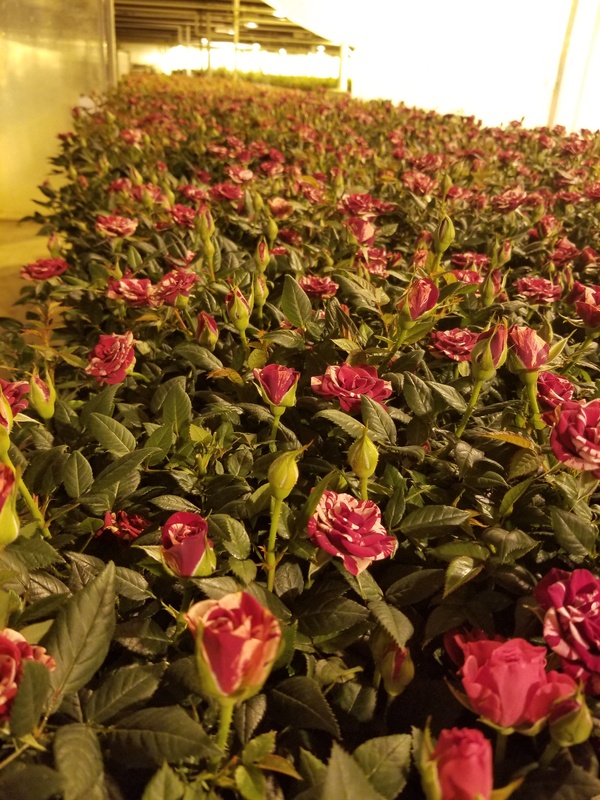 Valentine’s Day harvesting and shipping is upon the rose growing company and they're up to ship out over half a million Poulsen Roser roses over the next 10 days. In their location, Burlington in Ontario, there is 30 cm of snow on the ground. "Last night we loaded a truck, headed for Texas, he was 100 km down the road, the heater unit for the box was set for 10°C, and his fuel line to the heater froze shutting down the heater, he could not get a repair truck quickly as they are so busy. He headed back for our warehouse in Burlington, the truck was at 3°C when he got back and unloaded… thank goodness, product was fine. Another truck driver had product on racks in his truck, he had to open his doors quickly to back into our dock – the back 2 racks froze in the minute he took to back in. There should have been extra protection for the plants." With all boilers working at full capacity, owner Len Vander Lugt is not sleeping very soundly. "Knowing that at this temperature we have minutes to fix a boiler problem, not hours, before the crop is compromised. The energy curtain stays closed longer, we will wait for the sun to be up and slowly help warm the glass." However - also here there's a positive note. "Weather looks much better for the weekend: -12° is the high Friday, Saturday will be 3°C, Sunday will be 4°C." Also in Southern New Brunswick they have been experiencing a cold snap. 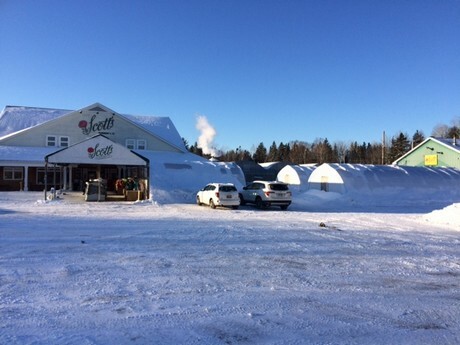 "We have been fortunate today it is -15°C and going down to Minus -20°C this evening with a light wind, the mind chill is -25°C", says George Scott of New Brunswick based Scott's Nursery. "It snowed most of the day yesterday and there is not a cloud in the sky this morning. "We live in the Maritime Provinces, east coast of Canada and the joke is 'if you don't like the weather, wait fifteen minutes, it will change,'" he laughs. And it's been cold for a while now. According to Scott, the weather turned cold in early November and continued in January with snow storm after snow storm, and temperatures have been up and down. "The last storm was 20 cm snow changing to rain. Enough rain to cause flooding, and it changed to freezing rain that left 20 to 40 mm of ice in the snow, making it very heavy on greenhouses.The snow came early and stayed there for strawberries, perennials and field crops should be well protected." The greenhouses at Scott's Nursery are practically seasonal covered but normally unheated. However, the heavy snow has forced them to burn extra fuel to melt snow and extra labor in plowing and raking snow off the roofs of Quonset houses to prevent them from collapsing. "The extreme cold causes us to overheat some crops to melt snow off the roof and may interfere with the timing. If you leave the snow layer on the roof it cuts the light and causes the crop to stretch. There has been some cuttings arriving frozen, extreme cold makes for very hard shipping and Murphy's law says the day your most tender and largest shipment is coming will be the coldest day of that week." Read Robert Colangelo's post, mentioned in the first paragraph, here.